If you're contacting us to request permission to use our content, let us save you some keystrokes: all of our content is Free to Use, Free to Share, and Free to Remix as you see fit for your training needs! That is the beauty of the Creative Commons License we have applied to all of our content. 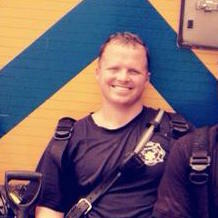 The FD-CPR Team is Michael Herbert and Christopher Watford. However, they are merely the names and faces behind the website. FD-CPR is owned by the firefighters, EMS providers, training officers, and the departments who implement it. You are FD-CPR. Michael is a Clinical Educator with Zoll Medical and a FireFighter/Paramedic with Leland Volunteer Fire/Rescue Department, Inc. He has worked all sides of Fire and EMS, from a tailboard rookie up to a line officer. 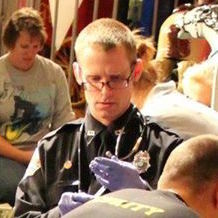 He is a two-time State of North Carolina champion paramedic, an enthusiastic educator, a physiology nut, and a lifelong learner. Christopher is a Senior Software Architect with Global Nuclear Fuel - Americas (GE) and a part time paramedic with New Hanover Regional EMS, and a senior editor with the EMS 12-Lead Blog and Podcast. When he worked for the former Leland Volunteer Fire/Rescue Department he was a two-time State of North Carolina champion paramedic. Christopher is an ECG fanatic, a devourer of research, and enjoys mixing software with medicine. © 2014-2018 Michael Herbert and Christopher Watford. The Firefighter Down: CPR Project by Michael Herbert and Christopher Watford is licensed under a Creative Commons Attribution-ShareAlike 4.0 International License.